As another school year comes to an end, you might want to make a gift to show appreciation to your child's teacher. This fun DIY pencil holder — made from pencils — is cute and functional. 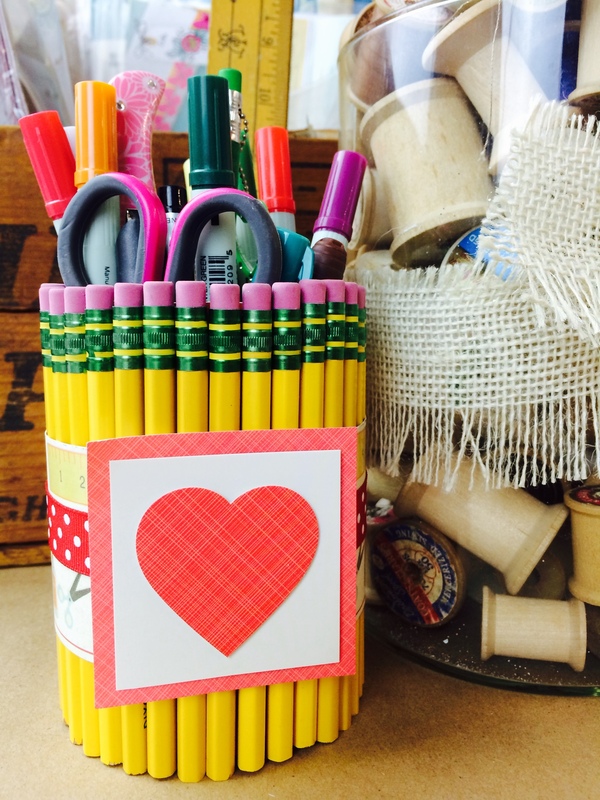 This fun DIY gift for teachers was shared by Xyron designer Beth Kingston. Measure height of can (past lip) and add 1/4 inch. Trim paper to 12-inch x that measurement. Add another 1/4 inch to the above measurement and cut your pencils to that length (cut from the bottom of the pencil). Run cardstock through Xyron 5-inch Creative Station. Peel off clear film and cut most of the exposed backing from around the cardstock. Flip cardstock over (so backing is on top) and run through the Creative Station again. Peel off clear film. Peel backing from both sides of the cardstock, set can down on work area and wrap cardstock around the can. You may cut off excess or just continue to wrap it around the can so it overlaps by several inches. Press pencils vertically to can (make sure they are straight up and down). Cover entire can. Cut 2- to 2.5-inch strip of patterned paper (patterned side up) and run through Creative Station. Peel off clear film. Remove patterned paper from backing and wrap around center of can. You may cut off excess or just continue to wrap it around the can so it overlaps. This will help hold the pencils in place. Tie ribbon around can and embellish as desired. Where to buy^ Xyron products are available at Walmart, Michaels, Joann’s, Hobby Lobby and Amazon.com.